Today I released my 8th wordpress plugin. This one is quite a bit different from all the other plugins I have written. 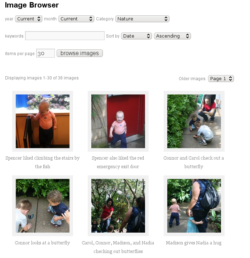 A friend of mine was looking for a way to create a gallery on his family blog. “No problem!”, I told him, “there are lots of plugins for that”. But I then quickly realized that no plugins were available for what he was looking for. All of the other image gallery plugins for wordpress function by creating galleries manually, say a gallery of wedding photos, or a gallery of a trip to the zoo. My friend was looking for an easy way to browse all pictures he has ever posted on his blog. That is what the Image Browser plugin does. It allows you to browse through all of your pictures on your blog, and also allows you to restrict by year, month, category, and by caption text. It is easy to install and use. Simply install it, then create a new page, and insert the [[imagebrowser]] shortcode. That’s it. Options can be set either in the settings page, or by using shortcode parameters. If you would like a demo, please take a spin at my family blog gallery, or the image browser page on this site. This entry was posted in photography, php, sql, wordpress. Bookmark the permalink.